It’s comprised of two lakes separated by a reservoir, the smaller side slightly over three miles and the other side more than four miles (according to my Nike Plus). If I want to turn the four into a five or six-mile run, I’ve figured out some out and backs to make that side even longer. You can combine both sides of the lake for a longer workout. Not completely flat, but not a hilly route by any means, the lake is always populated and the scenery is incredible. Deer, turkeys and some of the most breathtaking views that make me feel like I’m not in the middle of West Omaha. Running at a track is one of my go-tos when it comes to short, or long runs. When I was training for my first marathon I did a majority of my weekday runs at various tracks in Omaha. I like that most tracks in town have cameras for safety. Tracks are well lit in the evenings and it’s rare that I’m the only person running. NO HILLS and a built in place to store and keep an eye on your water/Gatorade and anything else you may bring with you. “Cons” for a track workout? It’s the least scenic and least interesting route… you’re running in circles around an AstroTurf or grass rectangle. 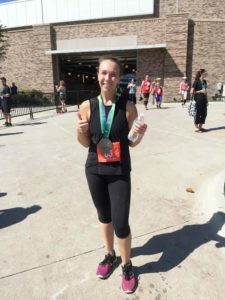 Co-Chair Emily Anderson is an avid runner who’s willing to share her favorite spots around town to log some miles. I’m most likely to run a three to five-mile road route over my lunch hour. I try to push myself because I know I have limited time… and find routes that are challenging by adding hills so I can work on my inclines, finding routes that I’ve never tried (which works on my memory), and adding in anaerobic bursts to work on speed. If I’m running on a trail (I love the West Papio Trail and the Big Papio Trail), it’s after work or during the day on the weekend. It’s rare that I go on a trail run with a distance in mind… I like that I can do an out and back… so I just turn around when my body (or mind) tells me that I’m halfway done whether that’s one mile or eight miles in. I do find it challenging (for the longer) distances to stay as hydrated as I would on the aforementioned track workout. No matter the route, the distance or the location, I try to go with some sort of a plan in mind. I like that it’s just me and my music, that I’m competing against my last best time, and that running is completely free. Finally, I also let someone know where I’m running and how long I plan to run. What are you favorite places to run in Omaha? What do you run for? The 2nd annual bRUNch5k will be held on April 29, 2017, at Midtown Crossing. Sign up online to register for the run/walk and brunch! Not a runner? Brunch-only tickets are available too!